Celadrin® is a complex of esterified fatty acid carbons (myristic, myristoleic, oleic, palmitoleic, palmitic, lauric, decanoic and stearic acids) specially developed and patented to reduce inflammation and pain in the joints with no side effects. What distinguishes Celadrin® from other chondoprotective nutrients is the speed with which it acts (applied topically, Celadrin® Forte produces effects in 30 minutes) and the continuous and cumulative benefits it provides. Research has shown that the esterified fatty acids in Celadrin® inhibit inflammation of endothelial cells and significantly reduce the pro-inflammatory effects of arachidonic acid. 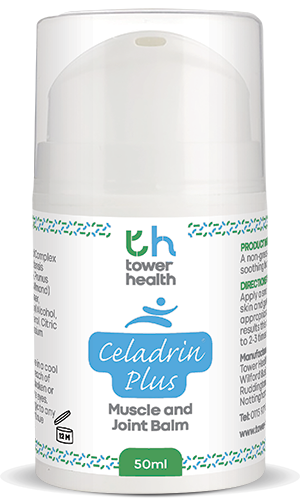 Celadrin® also decreases production of interleukin-6 (IL-6) and controls other immune factors responsible for inflammation. Celadrin® also acts by restoring the plasticity and elasticity of cell membranes in the fluids which enable the joints to move with ease. Celadrin® demonstrably reduces pain and improves mobility in a range of joint, muscle and tendon pathologies. ¤ Applied topically, Celadrin® improved mobility and quality of life in 40 osteo-arthritic patients (Journal of Rheumatology 2004;31:767-74). ¤ Improvements are particularly noticeable in everyday activities such as climbing stairs, standing upright, getting up from a chair and walking. Topical application boosts oral supplementation by providing rapid pain relief which complements the basic treatment. ¤ Celadrin® is a totally natural and non-toxic ingredient which we are offering in the exact form and dosages used in those studies which have demonstrated its efficacy. Celadrin® Forte cream contains 7.5% Celadrin® and 1.5% menthol. Other ingredients: AQUA, ESTERIFIED FATTY ACID COMPLEX WITH OLIVE OIL, ALOE BARBADENSIS (ALOE VERA) JUICE, MENTHOL, PRUNUS AMYGDALUS DULCIS (SWEET ALMOND) SEED OIL, GLYCERIN, CARBOMER, GLYCERYL STEARATE, CETEARYL ALCOHOL, PEG-100 STEARATE, TOCOPHEROL, CITRIC ACID, BENZYL ALCOHOL, POTASSIUM SORBATE. Not to be taken, for topical use only. Celadrin® is a registered trademark of Imagenetix. Adults. Apply Celadrin® Forte twice a day or as required. Topical application boosts the efficacy of oral supplementation.